Urine Off Flooring Professional Formula is specially formulated for use by Flooring Professionals on carpeting and all types of subflooring. It uses specialized enzymes and bacteria to break down the components of urine that cause odor and stains, as well as their proteins that host growth of undesirable microorganisms. Urine Off can be used as a pre-spotter, a carpet cleaning agent, and a subfloor treatment prior to laying carpet. It is the only product that carries both the “Seal of Approval” from the Carpet and Rug Institute (CRI), and is endorsed by Interface Flooring. 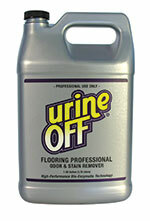 Urine Off is an essential tool for the Flooring Professional.